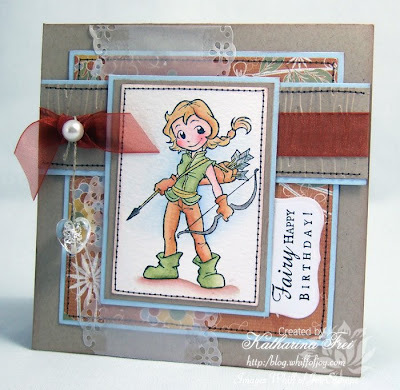 *Katharina Frei* - Kreatives Sammelsurium: Fairy happy birthday! "Kreative Kanten" ist das dieswöchige Thema des Cute Card Thursday blog. Distressing, Reißen, Sanding und Nähen ist alles erlaubt :) Ich habe mal wieder zu wenige Geburtstagskarten, deswegen habe ich mich entschlossen wieder aufzustocken. I coloured Rogue Charlotte with water soluble pens and Twinkling H2Os and sewed around the borders. I used Sketch Saturday's sketch from last week for inspiration. I love Jo's sketches! Ich habe Charlotte als Bogenschützin mit Aquarellstiften und Twinkling H2Os coloriert und rundherum mit der Maschine genäht. Als Inspiration habe ich den Sketch von Sketch Saturday's der letzten Woche verwendet. Ich liebe Jo's Sketche! The sentiment is from the Whiff of Joy "Fairy Useful Sayings" collection designed by myself :) I cut it with Spellbinders Labels 1 Nestabilities. Der Text ist von der Whiff of Joy "Fairy Useful Sayings" collection, die ich selbst designed habe :) Ausgestanzt habe ich ihn dann mit Spellbinders Labels 1 Nestabilities. I got the ribbon in a Raspberry ribbon kit and the clear crystal heart at my local craft store. I adhered it to the bow with SU linen thread and a halfpearl. Das Band habe ich von einem Raspberry ribbon kit und das Kristallherz aus meinem lokalen Bastelladen. Befestigt habe ich es mit Leinenfaden von SU und einer Halbperle. Boah die is süß geworden! a gorgeous card hun, love the way you have attached your sweet heart. and your colouring of charlotte is stunning. bet your wash pile isn't as huge as mine!!! lol..
Wow Katharina I just love this card!! All the details are so pretty and I love the earthy colors!!! Your sewing is fab as well!! This image is just the cutest ~ love the idea of her!! Fab card Katharina, love the added details. they just make a card look so special. Know what you mean about the laundry lol. Fabulous colouring as always great to see you using your soluble pens again :) Love your work with these. just love the card, so it's ok sometimes to post something small keeps us exciting for towmorrow! Fab card as alway Katherina-I've some more of your yummy medieval stamps winging their way to me in the post-can't wait to ink them up! Beautiful card, I love Rogue Charlotte's cheeky stance and grin. Love your papers and the stitching! Stitching drives me insane, lol. Best of luck with the laundry pile...ick!! Such a perfect card Katharina! What a sweetie Katharina! Love your coloring and the charm is so pretty! Absolument merveilleux, j'adore vos cartes. Fantastic,love the design and your colouring is fabulous!!! Aaaaah...I start to like the images by Alison Acton more and more!! This one looks sweet and tough at the same time. Lovely card you made with it, love the crystal heart. fantastic card Katharina, the vellum looks fabulous and I love the sentiment! 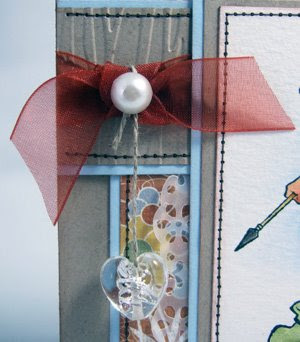 Great card..a beautiful image and I love the contrast of the stitching..one of my fav things to do! Gorgeous addition of the crystal heart! I finished my huge pile of washing this morning only to have it soaked by some April showers !! 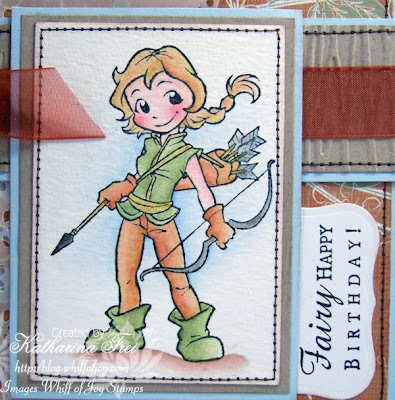 This is a fabulous card - i love this image and the colours you have used are so nice.